See Amy Berg’s BLOG Tuit Nutrition. There was no significant difference in the amount of weight loss in response to diets containing either 15% (8.9 +/- 0.6 kg) or 45% (7.5 +/- 0.5 kg) carbohydrate. Low carb for the win again! Here’s an interesting study on protein overfeeding (Jose Antonio, Corey A Peacock, Anya Ellerbroek, Brandon Fromhoff and Tobin Silver. The effects of consuming a high protein diet (4.4 g/kg/d) on body composition in resistance-trained individuals. Journal of the International Society of Sports Nutrition 2014:11:19.). 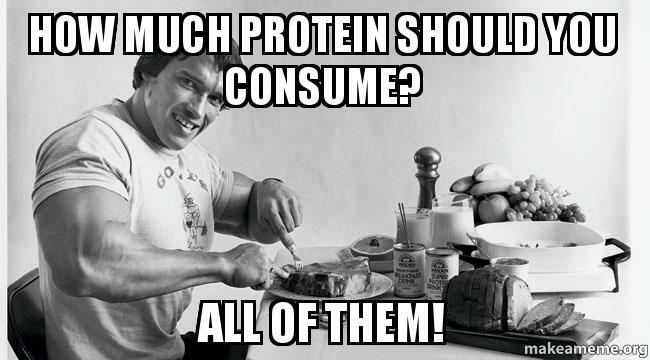 The HP group consumed significantly more protein and calories pre vs post (p < 0.05). Furthermore, the HP group consumed significantly more protein and calories than the CON (p < 0.05). The HP group consumed on average 307 ± 69 grams of protein compared to 138 ± 42 in the CON. When expressed per unit body weight, the HP group consumed 4.4 ± 0.8 g/kg/d of protein versus 1.8 ± 0.4 g/kg/d in the CON. There were no changes in training volume for either group. Moreover, there were no significant changes over time or between groups for body weight, fat mass, fat free mass, or percent body fat. Consuming 5.5 times the recommended daily allowance of protein has no effect on body composition in resistance-trained individuals who otherwise maintain the same training regimen. This is the first interventional study to demonstrate that consuming a hypercaloric high protein diet does not result in an increase in body fat. Here’s the table for the data (BW= Body Weight, FFM = Fat Free Mass, FM = Fat Mass, BF = Body Fat percentage). The High Protein group actually lose body fat and gained fat free mass in spite of overeating Protein and calories. The results of the current investigation do not support the notion that consuming protein in excess of purported needs results in a gain in fat mass. Certainly, this dispels the notion that ‘a calorie is just a calorie.’ That is, protein calories in ‘excess’ of requirements are not metabolized by the body in a manner similar to carbohydrate. Author DougPosted on May 30, 2018 May 30, 2018 Categories Protein Sparing Modified Fast (PSMF), Recomposition, StudiesTags macros, protein4 Comments on Too Much Protein? Very Low Calorie diets can cause LDL numbers to increase temporarily (Am J Clin Nutr. 1991 Jun;53(6):1404-10. The transient hypercholesterolemia of major weight loss. Phinney SD, Tang AB, Waggoner CR, Tezanos-Pinto RG, Davis PA.). Serum lipoproteins, body composition, and adipose cholesterol contents of six obese women were studied during and after major weight loss by very-low-calorie diets (VLCDs). Subjects started at 168 +/- 11% of ideal body weight, lost 30.3 +/- 3.7 kg in 5-7 mo, followed by 2+ mo in weight maintenance. Serum cholesterol fell from a prediet (baseline) value of 5.49 +/- 0.32 to 3.62 +/- 0.31 mmol/L (P less than 0.01) after 1-2 mo of VLCDs (nadir), after which it rose to 5.95 +/- 0.36 mmol/L (peak, P less than 0.01 compared with nadir and baseline) as weight loss continued. With weight maintenance, serum cholesterol fell to 4.92 +/- 0.34 mmol/L (P less than 0.05 compared with peak). Adipose cholesterol content did not change in peripheral (arm and leg) biopsy sites but rose significantly in abdominal adipose tissue with weight loss. We conclude that major weight loss was associated with a late rise in serum cholesterol, possibly from mobilization of adipose cholesterol stores, which resolved when weight loss ceased. Here is a second paper on the same issue (Al Dahmani, Khaled Mohammed et al. Transient severe hypercholesterolemia following bariatric surgery treated successfully with increased food intake. Nutrition , Volume 32 , Issue 3 , 394 – 396). …a case of transient severe hypercholesterolemia after bariatric surgery treated successfully with increased food intake. A 25-y-old policeman who had sleeve gastrectomy for morbid obesity 10 mo previously presented with generalized weakness, constipation, and significant weight loss after severe dietary restriction. All his preoperative and prior investigations were normal. Further investigation revealed severe total and low-density lipoprotein hypercholesterolemia. After all other causes of secondary hypercholesterolemia were excluded, a diagnosis of starvation-induced hypercholesterolemia was made. The patient was therefore started on a normal mixed diet gradually increased to achieve satiation. His dietary intake, body weight, and lipid profile were monitored over a 3-mo period. Eventually his symptoms abated, weight increased, and lipid profile returned back to normal levels. Although dietary management of failed weight loss after bariatric surgery is the main priority for health professionals, this case illustrates the possible harm of severe dietary restriction after surgery and the need for judicious dietary and nutritional management. Macros Calculator – Calculate macros based on Ted Naiman’s Burn Fat Not Sugar Protein to Non-Protein Energy ratio and macros. Keto Calculator – Calculates PSMF, Zone, Standard American Diet (SAD) , keto maintenance macros, extended fasting estimator, body fat (Calculated and ideal), and genetic muscular potential. Lipids Calculator – Calculates ratios and indices related to blood lipid numbers. 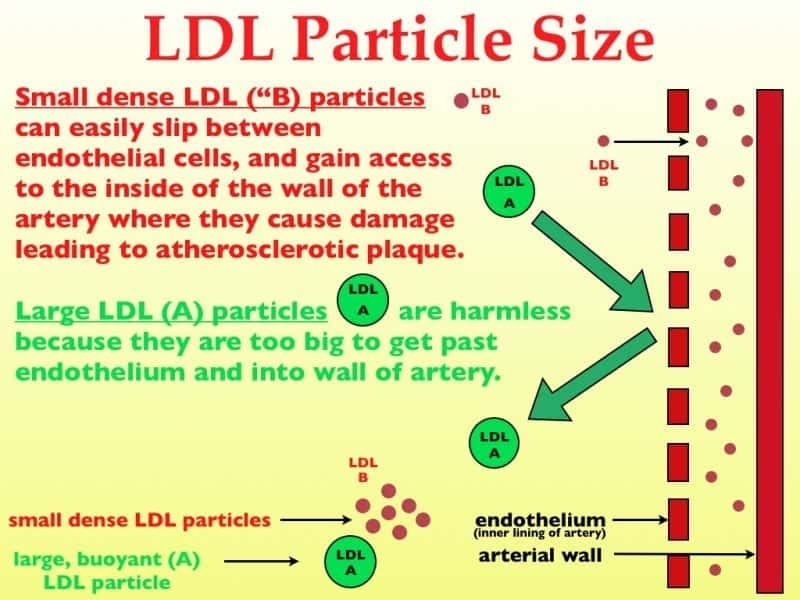 There are different types of LDL particles. They are classified by at least two phenotypes (A and B). Phenotype B is associated with heart disease (LDL subclass phenotypes and triglyceride metabolism in non-insulin-dependent diabetes. K R Feingold, C Grunfeld, M Pang, W Doerrler and R M Krauss. Arteriosclerosis, Thrombosis, and Vascular Biology. 1992;12:1496-1502, originally published December 1, 1992). A common, heritable phenotype characterized by the predominance of small, dense LDL particles (LDL subclass phenotype B) is associated with relatively increased concentrations of plasma triglycerides, reduced levels of high density lipoprotein, and increased risk of coronary artery disease in comparison with subjects with larger LDL (LDL subclass phenotype A). The LDL B phenotype was associated with higher plasma triglyceride levels and a trend toward lower high density lipoprotein cholesterol levels compared with the LDL A phenotype in the NIDDM subjects, as has been previously observed in control groups. Indices of diabetic control, such as fasting and hemoglobin A1 levels, were similar regardless of LDL phenotype pattern, suggesting that glycemic control was not likely to account for the increase in the LDL B phenotype. In both control and NIDDM subjects, the clearance of triglyceride-rich lipoproteins was slowed in the subjects with the LDL phenotype B compared with those with the A phenotype. A triglyceride/HDL cholesterol ratio of 3.8 divided the distribution of LDL phenotypes with 79% (95% confidence interval [CI] 74 to 83) of phenotype B greater than and 81% (95% CI 77 to 85) of phenotype A less than the ratio of 3.8. The ratio was reliable for identifying LDL phenotype B in men and women. I created an on-line lipids calculator to calculate the number from blood test results. See also (Why LDL-Cholesterol May Be Overestimated on a Low-Carb, High-Fat (LCHF) Diet). 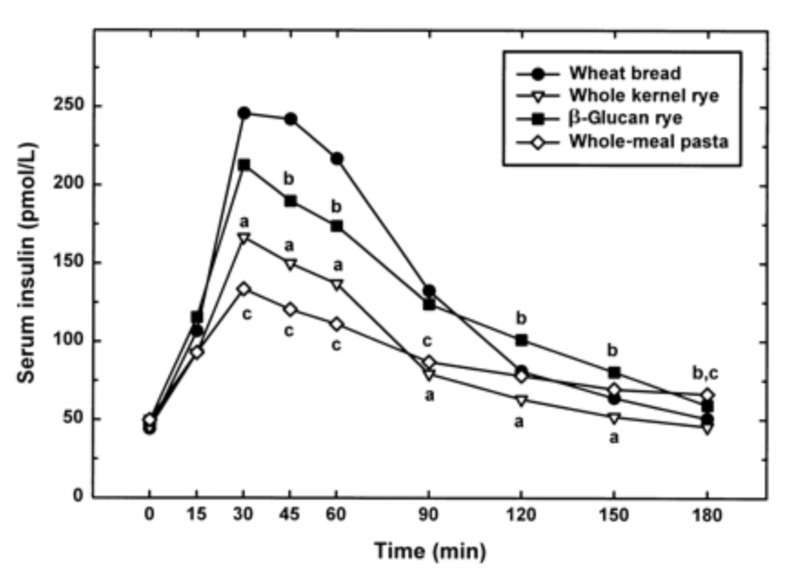 That is quite a bit of difference between the peak for Wheat Bread (at 250) and Whole Meal Pasta (about half at around 125). If you are attempting to minimize Insulin response that could be a big difference. 671,959 patients underwent gastric bypass procedures in the United States from 2003 to 2008. The mean time from gastric bypass to documented hypoglycemia is about 28 months. Serious symptoms, including needing third-party assistance, the prevalence was 11.6%. Roux-en-Y patients who wore a continuous glucose monitor for 86 months after surgery and found that 38% had hypoglycemia. The article suggests various treatments. A friend told me about a side effect of bariatric surgery (Post-gastric bypass hypoglycemia: A serious complication of bariatric surgery). One long-term risk is the development of postprandial hypoglycemia. This phenomenon was first described in the literature in 2005. The prevalence still remains unknown, but as endocrinologists we will undoubtedly be seeing more of these patients. Hypoglycemia typically does not present until 2 to 3 years after gastric bypass surgery. These hypoglycemic episodes are characterized by low blood sugars that occur 2 to 3 hours after a meal. Fasting hypoglycemia is typically not seen. The etiology seems to be excessive insulin secretion in response to the meal. It is well documented that patients are more insulin sensitive after gastric bypass surgery, but the pathophysiology of these specific patients who develop hypoglycemia remains unclear. It is hypothesized that it may be related to elevations in the incretin hormones glucagon-like peptide 1 and gastric inhibitory polypeptide, and their ability to stimulate additional insulin secretion. It has also been debated whether increased beta-cell mass may lead to excessive insulin secretion. The article concentrated on the reaction to carbohydrates. In Part 2 I will start to look at possible ways to compensate for this issue from a Low Carb diet perspective.